HOFFMAN ESTATES, IL – October 17, 2017 – The Collision Repair Education Foundation has selected the winner of its “Collision Students of the Year” award. This year’s recipient, nominated by her collision instructor, Andy Retz, is Rosalinda Pop-Pablo, a high school senior studying collision repair at Lorenzo Walker Technical College in Naples. Florida. Both the winner and her instructor will receive a trip to SEMA 2017 where the pair will be honored at the Education Foundation’s evening reception on Tuesday, October 31st. Makayla Baldwin, Bradley Central High School, Cleveland, Tenn.
Dylan Wertz, Sentinel Career & Technology Center, Tiffin, Ohio. All industry members are welcome to join the Collision Repair Education Foundation during SEMA 2017 to celebrate Pop-Pablo’s achievement who will be honored at the Collision Repair Education Foundation Industry Reception at 9:00 p.m. on Tuesday, October 31st at the Renaissance Hotel. To RSVP for the event, please email info@ed-foundation.org. Those interested in joining the Collision Repair Education Foundation and supporting local collision school programs, should contact Director of Development Brandon Eckenrode at Brandon.Eckenrode@ed-foundation.org/ 847-463-5244. Annie Michalski, who attended Western Area Career and Technology in Canonsburg, Pa., was one of two named Collision Student of the Year in 2016. 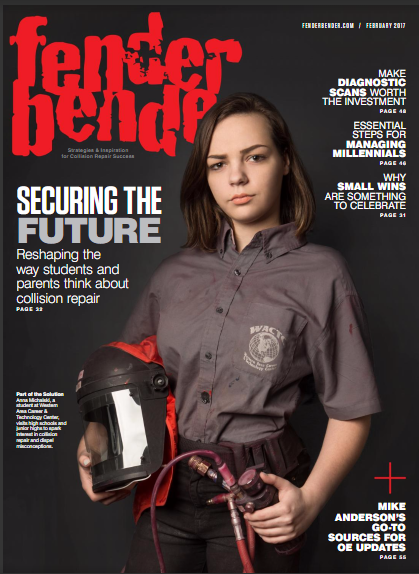 She was featured on the cover of the February 2017 issue of Fender Bender magazine. Nominations for the Collision Repair Education Foundation’s Collision Student of the Year award are Due September 22, 2017. The nomination form is available to download. Survey. If you are not sure if you participated, contact Janet Marczyk at janet.marczyk@ed-foundation.org. 31st and the instructor roundtable on Wednesday, November 1st at 9:00 a.m. Nominated student must be currently studying collision repair/refinishing at a school. Complete details, including rules and eligibility information is available in the nomination form.